Friday Fun Facts – Who are we? And, where do we come from? As a small business startup we spend a great deal of time looking at and analyzing data to help us drive strategy, make adjustments, and better understand our customers. We try hard to not be robotic in our response to numbers, but rather to let them inform our decisions and our direction and we believe that this is how all small businesses should use their own. Here is the fifth in a serial discussion of some of the data we look at internally, the numbers we analyze, and our strategic approach. 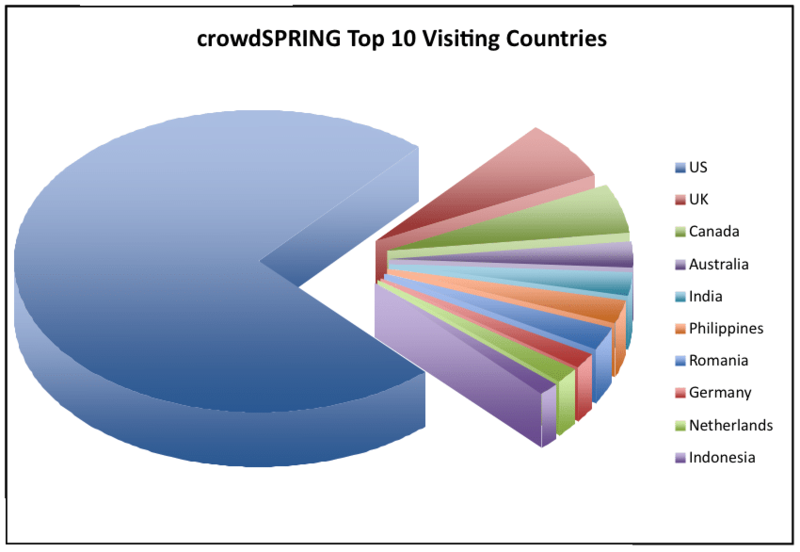 Last May, Ross wrote a post about the countries crowdSPRING reached and where our users were coming from. At that point in time we had been in business for a grand total of three weeks and had 1,227 registered users. We had visitors from 122 countries back then and on that day we had 1,599 visits. Well, we’ve grown a bit since then – here is some cool data(along with some neat charts) for your reading pleasure…. As of today, our visitors come from 196 countries and every continent (except Antartica – still waiting on that one). They spend an average of almost 13 minutes for each visit. Our visitors speak 124 languages. crowdSPRING buyers come from 41 countries. US Buyers account for about 75% of our projects to date. Buyers from Belize account for 0.059% of projects to date. Our busiest repeat buyer has already posted 10 projects on the site. Since January 1, we have registered an average of 173 new Buyers per week. As I write this, we have 4,097 Buyers registered. Creatives who have won a project come from 51 countries. US Creatives account for about 51% of projects awarded to date. Creatives from Paraguay account for 0.063% of projects awarded to date. Our most successful creative has already been awarded 47 projects. Since January 1, we have registered an average of 401 new Creatives per week. As I write this, we have 15,601 Creatives registered.